As we know that AVG is one of the most trustable antivirus available on the internet. It is used to remove any type of virus, spyware or malware. But I have seen that some users are not able to uninstall or remove AVG antivirus from control panel on their system while some time it causes error while uninstalling AVG antivirus. So in this guide you will uninstall AVG antivirus Free 2015 with the use of AVG Antivirus Removal Tool 2015. AVG Removal Tool is officially launched by the AVG technologies for the users who are not able to uninstall AVG antivirus properly. If you are not able to uninstall AVG antivirus through traditional way that is using Control Panel then follow the step by step guide. Press Window Key+R or open Run and type "Control Panel" in the text field, hit enter. This will open Control panel on your system. Just navigate to this path now Control Panel >> Programs >> Programs and Features. It will show a complete list of installed softwares on your system, search for AVG 2015. 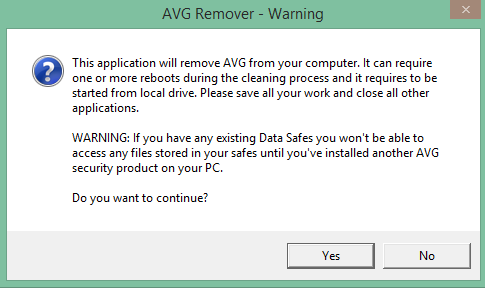 Select AVG 2015 and then click on Uninstall/Change button. Now a dialog box will open which will give you some options such as Update AVG, Uninstall AVG. Click on Uninstall AVG, Next, select "Remove user settings" (don’t do this if you’re planning for a reinstall) and "Remove Virus Vault contents" and click ‘Next’ button. Now just restart your system to make the changes appear. Now if the un-installation process fails or shows an error then it's time to remove it with the official AVG removal tool 2015. Now just install this tool on your system and follow the step by step process to remove AVG 2015 antivirus from your system. Both are verified & official tools from AVG technologies so you don't need to think about any type of virus or malware problem. It will remove AVG user settings, virus vault contents, and other files related to AVG installation. If you have any doubt or query then feel free to leave a comment in the comment section below.